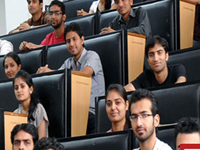 'Educating India Educating World' is the endeavour of Abide Education Trust Distance Education, which is established to cater to the needs of students who cannot pursue formal education in colleges and universities. It allows upgrading of skills, increase in productivity and development of a new learning culture with the use of cutting edge technological advancements. It makes significant contribution to enhance the cause of higher education by emerging as relevant and appropriate revolution to meet the challenges of access, affordability, suitability and portability. Abide Education Trust is a proudly Indian truly global university, bringing the world to campus through a variety of programs, activities and initiatives and sending Abide Education Trust students and teachers out into the world through study abroad, internships, research and international entrepreneurship opportunities.